As my longtime readers may recall, we stayed in this house for Sukkot 2016 and were invited into the sukkah of our host’s father for the first day of Sukkot. Later in the week we were invited into the moshav’s synagogue for Simchat Torah as well as back for the evening dance. It was easily one of the highlights of that stay in Jerusalem. Well, Tzemach outdid himself! While I had asked in advance if we might be able to attend synagogue one of the Shabbat while we are here, but he went the extra mile. 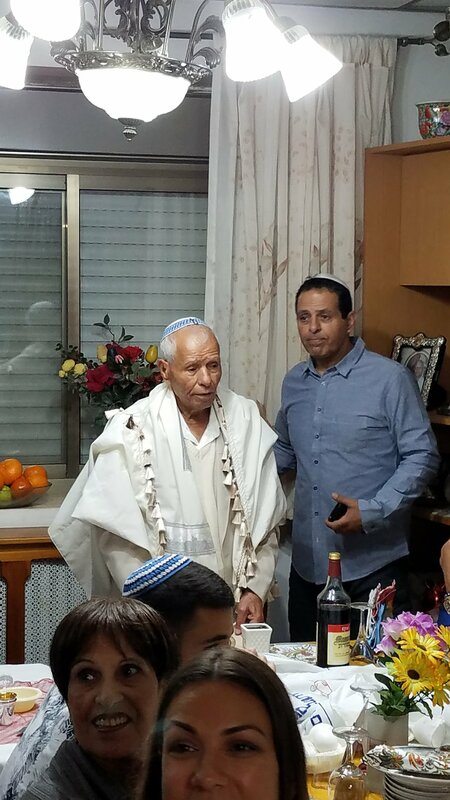 Two evenings ago he bounded up the stairs and announced that he wanted us to attend the Erev Shabbat prayers at his synagogue and then, big news, walk to his father’s house to observe them for the first part of their Pesach dinner. We were almost speechless. We all dressed and waited in anticipation of this special invitation. Several others, already on our guest list, came from Jerusalem. While we waited we sang multiple songs, common at the beginning of Shabbat. After we finished singing, David ben Aharon, Tzemach’s father came up the steps to the balcony. I saw him and immediately stepped outside where he greeted me with a kiss on both cheeks. What a sweet spirited and gentle 85 year old man. He greeted the others, then led us like a bunch of ducklings through several streets to the synagogue. David ben Aharon led us into the synagogue and he invited me to sit next to him. The service, all in Hebrew (d’uh… ), was a blessing to watch as prayers were made for the Shabbat and Pesach. While I understood little, I did catch the Amidah and the Shema as well as one of the Psalms. Despite not understanding, I could feel the Spirit and the warmth of the people. As we departed many, many men came and offered warm handshakes, “chag sameach,” and “Shabbat Shalom.” We then followed David through the now darkened streets to his home where we were invited in to a warm home electric with the excitement of visiting guests. As soon as we came in and had surrounded the table (18 of us. Chai? ), Tzemach asked us to sing… a surprise. We sang Shabbat shalom/Am Israel Chai/Od Avinu Chai. They joined in song while wondering at this crazy bunch from America, Holland, Germany, Switzerland and Russia who stood there to honor and learn. After they served us wine and invited us to join in the Kaddish, they shared bitter herbs and then let us know they appreciated our visit but it was time for us to go. We gave warm handshakes and greetings, then as we left Jossi, from Switzerland, led us in Ose Shalom! The table responded warmly to our singing as we exited and walked to Tzemach’s home for our own Pesach observance. Our observance was very special. 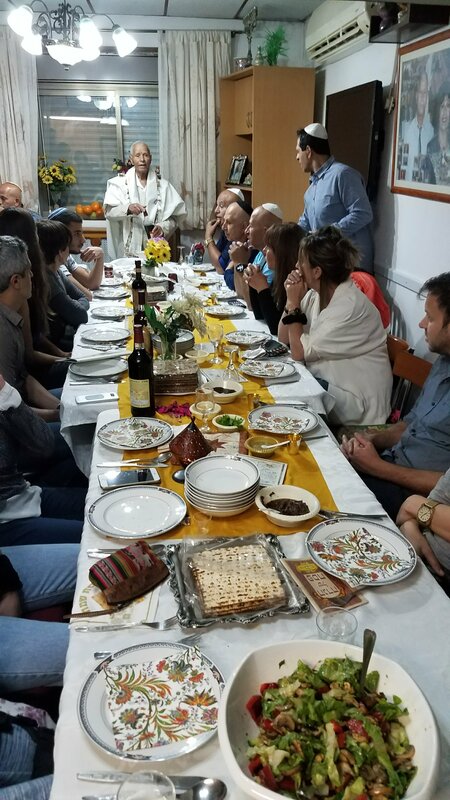 The table was surrounded by Ephramites from five different countries and set with food prepared as a shared effort by all. The meat, a sumptuous preparation, was done by Victor and Rosa. 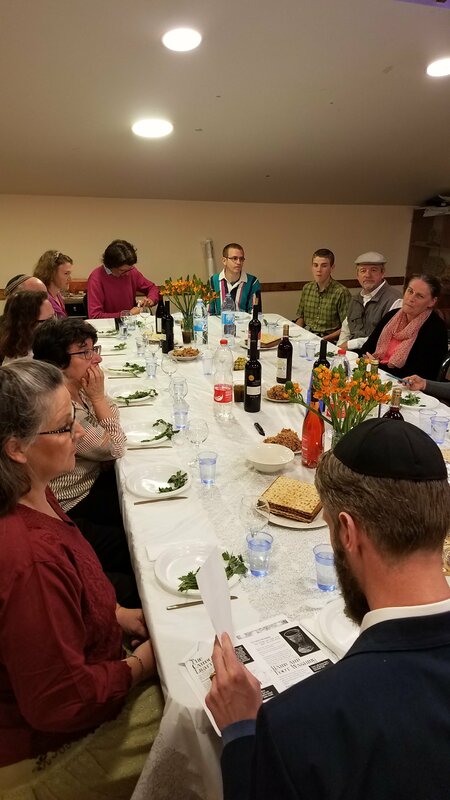 We honored the Torah and the Messiah while enjoying wonderful fellowship, conversation and fun. This entry was posted in B'Ney Yosef Congress, Holidays v. Feasts and tagged Chag Sameach, geulah, House of Israel, Passover, Two House. Bookmark the permalink. 1 Response to A Passover surprise!